The 3rd round of matches will begin on Day 9 of the 2018 Hockey World Cup. Pool A teams return to action. Argentina are the favourites to get a straight entry into the quarterfinals from this Pool as they have 2 wins out of 2 and are also likely to defeat France in their 3rd match. Meanwhile, Spain and New Zealand get ready to battle it out in an extremely important fixture. Both the teams are likely to make it to the crossover stages as things stand but they would not want to leave anything to chance. New Zealand defeated a gutsy French side 2-1 in the first game and lost 0-3 to Argentina in the second. Hence, they have 3 points currently. A lot will depend on how their star forward Stephen Jenness performs against Spain. Spain, on the other hand, played really well but eventually lost 3-4 to World Number 2 Argentina in their first match and drew 1-1 against France in their 2nd. As per these results, they are currently at 3rd place in the pool with only 1 point on board. The points table in no way reflects how well the Spanish players have played. They were even unlucky to lose their captain Miquel Delàs as he had to fly back to Spain to get treatment for his injury. Josep Romeu, Enrique González, Vicenç Ruizand Pau Quemada have all been excellent for the Frédéric Soyez-coached side and will be the players New Zealand will need to watch out for. Get ready for an exciting contest as both teams will be pulling out all their trump cards in this one. Even a 2nd place finish will do either teams a lot of good as that will ultimately decide with which Pool B they play their crossover match. Here's all you need to know about the upcoming match between Spain and New Zealand. The Black Sticks have not looked convincing at all in this edition of the World Cup. 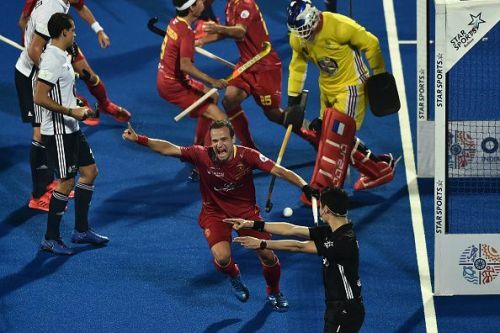 It is The Red Sticks who have performed well and they can be expected to surpass New Zealand's challenge. Darren Smith's troops are sure to have a tough time defending against Spain's prolific striking unit.